Are you ready for this?? Shipwright Pointe is proud to introduce the beautiful Burton Floor Plan! This 4 bedroom, 2.5 bathroom home includes a formal living and dining room as well as a lovely foyer and large second floor bonus room. The exterior is quite charming with great curb appeal and the front porch is just waiting for your ''welcome'' mat!The kitchen has plenty of storage space and a large breakfast nook that opens to an oversized family room with a charming fireplace. Stainless steel appliances include a smooth-top range, microwave hood, and dishwasher. The family room is large and spacious and comes with a ceiling fan and fireplace. Off the kitchen nook you will find a conveniently located laundry room. 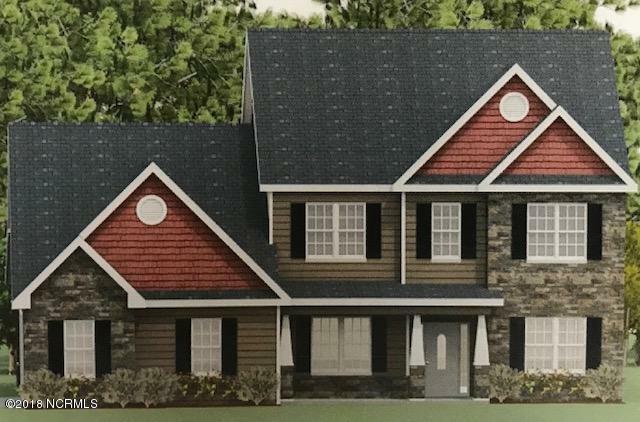 Upstairs you will find 4 bedrooms, 2 full bathrooms awell as an extra large bonus room The master bathroom boasts a double vanity, a tub and separate walk- in shower. The walk-in closet is a must see! A 2 car garage and huge rear covered patio complete this beautiful home. It will go fast! Located in the heart of Swansboro, very close to the beautiful Hammocks Beach State Park. Close to shopping, bases, schools and of course the beach! This home is an ideal location for anyone. There is still time to personalize this dream home. Call today to make your selections. Note: Floor plan renderings are similar and solely representational. Measurements, elevations, design features, among other things, may vary in final construction. Call to verify. Photos are of similar homes.